Filled with epic battle scenes, beautiful and bizarre descriptions of a moving iron city, and filled with big personalities, it is sure to appeal to history or fantasy-buffs. Even kids doing history at school might learn a thing or two about the way things could have been. 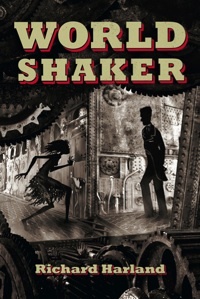 "In all re.spects, a worthy successor to Worldshaker … the distinctive mixture of extreme situations, fast and violent action, bizarre ad menacing imagery, and characters sometimes grotesque and comically or horrifically exaggerated, yet resting upon a foundation of psychological truth. It was good to be back in the world of the juggernauts." "Harland has a deft hand for balancing the icky and creepy—Col’s grandmother starves Menials, then cries over them; schoolteacher Mr. Gibber indeed gibbers and prances most spectacularly—with fast plotting, family rivalries and dashing heroics. The climax provides a page-turning, pulse-pounding read (the dash of romance helps). Why hasn’t Harland been published here before?" Le Figaro is the most famous of all newspapers in France. The first young adult novel translated from a successful Australian author, Le Worldshaker offers young readers an intelligent and accessible reflection on totalitarianism. The author has created a true adventure novel, rich in surprises. 13-to-16-year-olds but, even as an adult, it's hard to put down. This atmospheric novel is a fabulous start for anyone interested in test-driving the steampunk genre … Don't let the fantasy tag put you off; this novel jets along at a pace that belies its steam-powered gears. A BRILLIANT fantasy that will hook you from the very first page.